It is so much easier to knock a building down than it is to build one. Building is a long and involved process of dreaming, planning, scheming, and the wonderfully gritty bit that is actually constructing a physical manifestation of these things, while getting rid of a building sometimes takes no more than a bit of paperwork, some heavy machinery, and the stroke of a pen. The Princess Mary Club, a lovely but ageing 91-year old gothic style four-storey building nestled on a leafy section of Lonsdale Street in the Melbourne CBD next to her stately older brother the Wesley Church, found itself at the end of 2015 sitting precariously on the cusp of demolition in favour of a new office building development, awaiting others to decide her fate. The community had spoken out against the plans. In March 2015 the Greens Member of Parliament for Melbourne spoke to Parliament to persuade the Planning Minister to ‘protect the heritage values’ of the Club. A Change.org petition in favour of saving the building had garnered nearly 4,000 supporters. Despite all this, the development plan, which the Uniting Church who owned the Club had been kicking around for at least five years, had finally found a formula which stuck. Heritage Victoria granted a permit to demolish the building in November 2015, and on 1st December Melbourne City Council officially voted to approve the demolition. So it was that in the end of 2015 the Princess Mary Club awaited a decision from Planning Minister Richard Wynne, who had the ultimate power to approve or reject the development application – and the ultimate demolition of the building - with the stroke of his pen. Had you been there for the opening of the Princess Mary Club, you would have found that the only thing precarious was the nasty weather. It was streaming rain on 17th November 1926, so much so that the grand opening festivities had to be moved into the Wesley Church next door, and despite the weather the church was packed. The music of the Central Mission Tally Ho Brass Band also filled the church as the Lord Mayor himself, Alderman S.J. Morell, presided over and kicked off the addresses. Reverend Dr. Samuel J Hoban, minister at the Wesley Church and the original protagonist for the construction of the Central Mission Girl’s Hostel, as it was originally known before changing its name to the Princess Mary Club in honour of Princess Mary of England, did much of the talking. As Melbourne grew after the first world war, it experienced an influx of new residents from country Victoria and elsewhere, including women. The Club was intended to, ‘and this should appeal to many anxious mothers contemplating sending their daughters to town for the purpose of earning their living’, as Hoban said, provide a safe place in the city to support women migrants. Whether this was true or was simply a paternalistic justification has been the subject of some debate, however the intent was noble enough, enough so that Hoban convinced two wealthy local philanthropists Alfred and George Nicholas (who made a pile of money selling Aspirin after WWI ) to donate much of the money needed to fund the construction (around £60,000 in total). At this point the large group moved outside in the rain long enough for Mrs. Alfred Nicholas to undertake the ribbon cutting, one of George Nicholas’ daughters to officially unlock the door to the Princess Mary Club using a golden key, for everyone to pose on the steps for a quick photo, before heading inside for a tour. 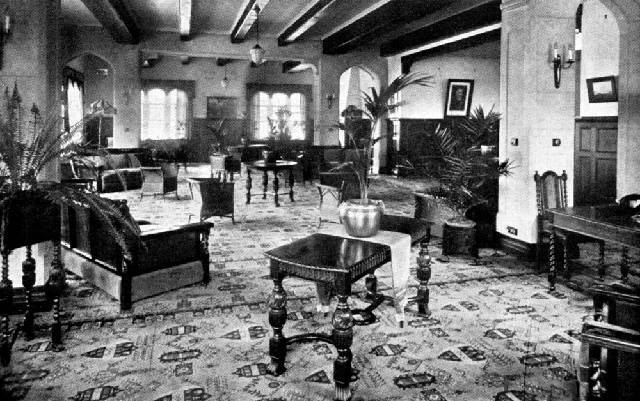 The Princess Mary Club on that opening day was at the height of her beauty, and the description of the building from the 18 November 1926 edition of The Age did not leave anything to doubt in its flowery description of the interiors. ‘The hostel is a handsome, massive building, containing four floors, and is as beautiful inside as it is dignified outside. Every detail has been planned with good taste, and not with extravagance, and the comfort of the girl has been studied in every way possible. An automatic lift (the interior of which resembled a gilded birdcage) connects the floors; a telephone is placed on each landing; the bedrooms are compact and dainty; the rest room was described as a dream and the writing room and diningroom are equally beautiful. The kitchen and servery are a delight, planned with a view to expedition and thoroughness, and the pantries with their wire shelves, the refrigerators, and all the annexes to this department, have been planned with wonderful forethought and thoroughness. The paper further gushed ‘the hostel is like Menzies Hotel (the finest hotel in Melbourne at the time) in class and the Salvation Army in price.’ One of the other attendees at the ceremonies that day, Mr. W. A. Wyatt MP heaped more praise on the Club: 'the building is a credit to the architect, for the facade might worthily occupy the finest boulevard in Australia’. The architect, one Mr. Alec Eggleston, was in attendance at the ceremonies that day, and you can imagine the satisfied grin on his face as the commendations kept rolling in. The Princess Mary Club was lucky to have an architect of the calibre of Eggleston, but you could say that him designing the building was a match 20 years in the making. Born in 1883 in Melbourne, he first struck out on his own as an architect in 1906 at the age of 23. His second project (the first being cancelled before it even started) was a commission that his father secured for him through one relationship or another, to renovate a dilapidated old house in Essendon owned by the Methodist Church. Eggleston later wrote of his dutiful and energetic inspection of the house, which ended abruptly when he disturbed a rat’s nest located inside and needed to defend himself against half a dozen of the rodents. 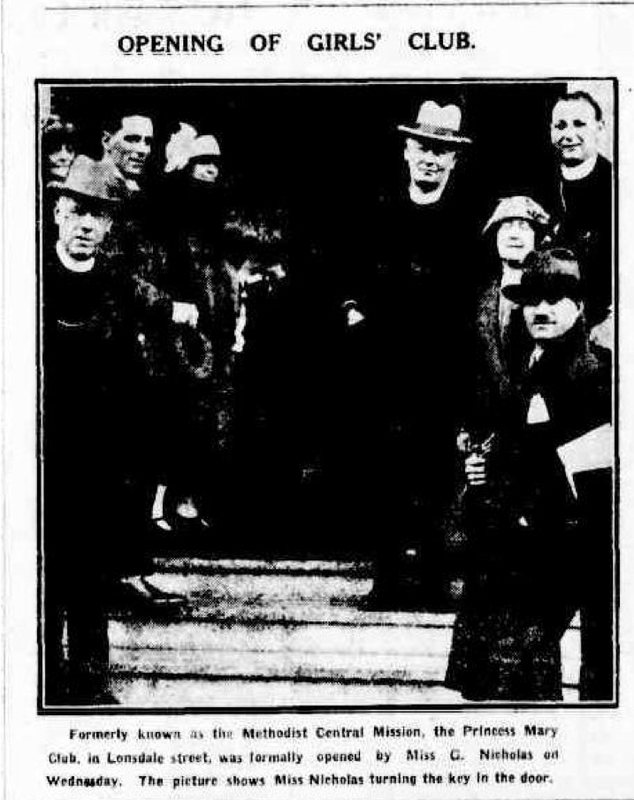 Rats aside, this began a long relationship with the Methodist Church, the owners of Wesley Church and the site at 118 Lonsdale Street where the Princess Mary Club would later be built, and likely led to his commission to design the Club. Eggleston went on to a distinguished career in Melbourne and was one of the preeminent architects of the time, designing, amongst other prominent churches, schools, and university buildings around Victoria, a lawn on the roof of the now gone Collins House at 360 Collins Street, which was used by a golf club for practicing driving. He was elected president of the Victorian Institute of Architects in 1937, and went on to form Eggleston, Macdonald, and Seacomb, which lives on today as the architecture firm Design Inc.
For many years, the Princess Mary Club dutifully and gracefully fulfilled her purpose, providing food, lodging, and social support for the 120 female residents. The Club often found itself hosting social events and fundraisers, and reports were written of concerts filling the Club with music and the tables being adorned with fresh flowers. Times slowly changed, however. In the 1930’s, the church began utilising the land behind the Club to sell motor cars. World War II came and went, and while migration to the city continued, attitudes toward women were slowly changing, and perhaps the church’s desire to protect those women moving into the city also changed with the times. The building came under the stewardship of the Uniting Church in 1977 when the Methodist, Presbyterian, and Congregational churches merged. It was not long after that parts of the Club began to be used for other commercial purposes. In 1985, the lounges at the front of the Club facing Lonsdale Street were occupied by a company called All Electronic Components. More recently, the Sicilian restaurant Pomodoro Sardo traded on the ground floor. The Princess Mary Club was officially closed to residents in 1988. The last 20 odd years have not been good to the Princess Mary Club. Unfortunately I was never able to see the Club for myself, however in October 2016 a photographic survey was taken of the building, and I can provide a tour of the almost 90-year old Princess Mary Club through those photos. Through the rubbish and old remnants of the restaurant located on main level, you can see some of the former glory. The old fireplace is still there, the beams can be seen on the ceiling, and amazingly the original wood panelling, trim and wood doors remain. Old beer kegs are stacked in one corner, waiting to be taken away. The beautiful original lift is still relatively intact, however it’s now filled with junk rather than passengers. Where it’s visible through the trash, dirt, and grime, mosaic tiling can be seen on the floors. Graffiti adorns many of the walls. A large room which may have been the first floor Lounge is filled almost top to bottom with junk - files, chairs, building materials, scraps of wood. Another room is filled with old carpet. Paint is peeling. As you move up through the building, the extent of graffiti becomes more intense. Levels two through four were primarily designed to include a large number of ‘dainty’ bedrooms, and this layout remains. However gone were the rosewood finished beds; instead the bedrooms have been crammed full of dirty mattresses. In one well lit room with happy light blue walls every horizontal surface was covered by a thick layer of bird crap. The original leaded glass windows adorned with a crest (a yellow shield with blue diagonal stripe) still sat in many windows and looked lovely amid the gloom and filth. A cut glass domed skylight on the second level was surprisingly well intact. A Christmas tree lay on its side in an empty room. Vines had fought their way through one window and were creeping along the walls. Moving up onto the top level of the building, the spaces looked more and more like a former bird sanctuary. A rooftop plant room was home to some ancient lift equipment which may have been original. Other rooftop rooms were crumbling - walls peeling and mildewed, covered in algae. Meanwhile, after many years of serving its congregation and the community, the church found itself to be in an increasingly precarious position: that of being asset rich and cash poor. 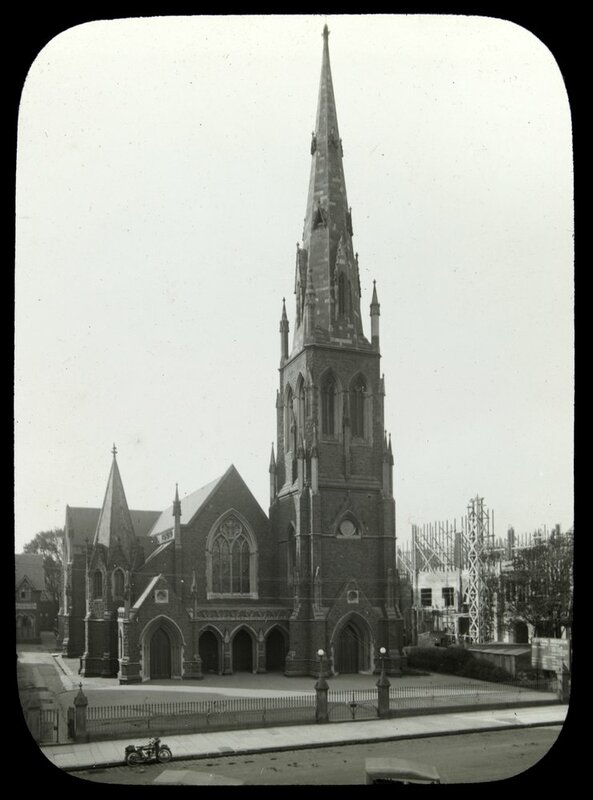 The Uniting Church owned lots of land around the city and Victoria in general, however land in and of itself does not produce any funds that the church needed to keep operating. Thus it was that around 2011 it started looking for opportunities to rectify this problem. As the calendar ticked over from 2015 to 2016, many eagerly waited to find out whether the Club would be given a reprieve from demolition, and the Planning Minister’s decision on the development application which was sent to him just before Christmas. On the opposition side, advocacy groups like Melbourne Heritage Action, local politicians and members of the community were hoping the Minister would come to his senses and protect the old Club. 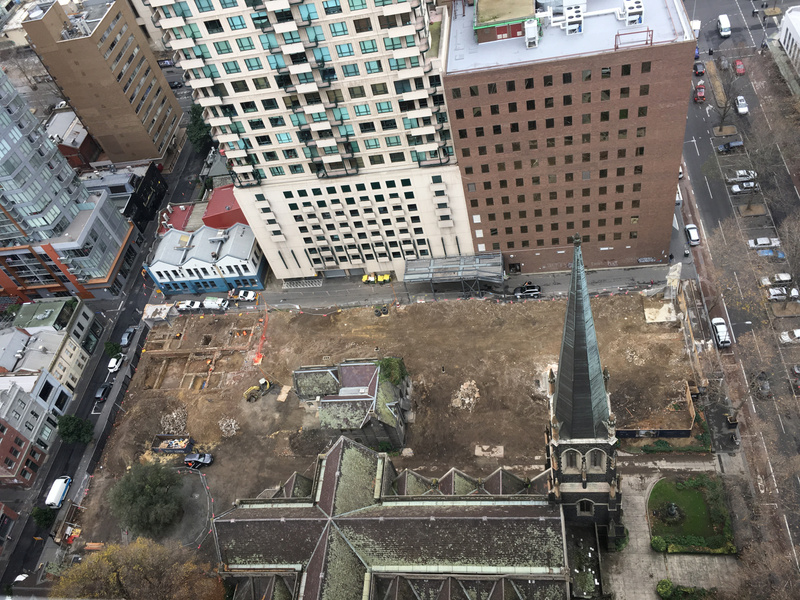 The developer Leighton Properties and the design team at Cox Architecture certainly sat on the other side, along with probably the most unlikely of supporters, the Uniting Church itself. The Minister did not make them wait long. In early 2016, Richard Wynne officially approved the application, which meant that the Princess Mary Club was destined to be demolished to make way for a 33-storey office tower. Wynne said that the design respected the site's heritage values, and enhanced the precinct's streetscape through new open space, and two public walkways. The decision outraged Sophie Patterson, the great-granddaughter of the man who put down the money to build the Club, Alfred Nicholas. "I think he'd be horrified. There was a lot of opportunities given to women because of this building," she said. The Uniting Church took a practical view in their eyes, noting that funds from the proposed development would provide money to restore the Wesley Church and other structures on the site, including the four oldest bluestone buildings on the site. "My fear would be that we would have to close the doors of the church in a few years’ time when the maintenance costs of the church just get out of hand," said Reverend Macrae, a representative from Uniting Church. Maintenance to other buildings notwithstanding, restoring the Princess Mary Club would also prove a difficult financial burden for the church, if you believe Heritage Victoria, who said that while the building was historically significant, cost estimates for restoration ranged from $13.5 to $18 million dollars. Charter Hall recently bought the rights to the development, which includes the 125-year lease of the land from the church. In place of the Princess Mary Club will be a sparkling new office tower called Wesley Place. It will have ubiquitous retail on the ground level, a public space fronting Lonsdale and another fronting Little Lonsdale, the two spaces connected by a plaza. It will not feature a stuccoed, gothic façade, with arched, leaded glass windows. Instead the Wesley Place will be tall, though not obscenely so, and it will be made of glass. It’s certainly not a bad looking building, and from the rendering it appears that there will be a tree on top, which is nice, however I do not agree with Mr. Wynne when he said that the design ‘enhances the streetscape’ over and above what the Club provided with her elegant grace. Charter Hall plugs the project as being worth around $500 million all up, which begs the question - $18 million or so could not have been spared to refurbish a piece of history to provide a truly unique feature to what’s really just another glass tower? On a day in early June of this year, the Princess Mary Club breathed her last and yielded to the wreckers. The Lord Mayor was not in attendance, and there was no band to mark the occasion. The sun shone and the Wesley Church sat empty on this day. 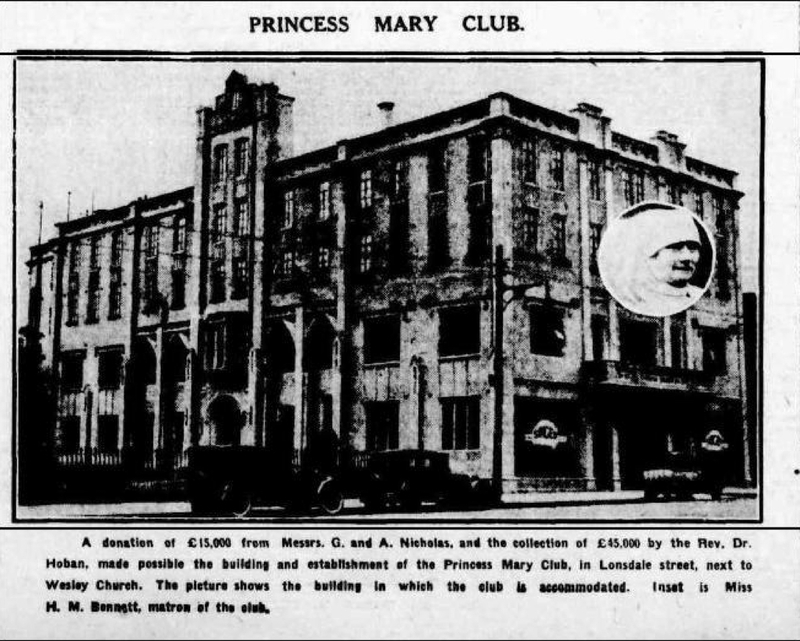 The Princess Mary Club was funded by philanthropists and inspired by the church, all of whom had the intention of doing good and helping young women who were moving to the city for the first time. It is a shame to lose a building whose stature and history goes beyond mere character, but maybe one can take some small solace in the symmetry of the world, because things have now come full circle: while the Princess Mary Club was built to fulfil the church’s mission to help others, it’s now been knocked down in order to help the church. Luke Naughton is a writer covering topics ranging from property and construction to business and design. He holds an MBA from Melbourne Business School and works as a project manager in Melbourne at Johnstaff Projects. More of his writing can be found at his blog on Medium.com. Absolutely disgraceful. The minister and church should be ashamed. Why a church should have the right to purchase buildings for use in commercial enterprises is just beyond belief (pun intended), and then to demolish and sell a historical building to hungry and amoral developers is outright beastly.